Not too long ago I saw this movie in which I observed that while the individual parts of it were kind of weak, the sum of these weak parts actually added up to something not so bad. 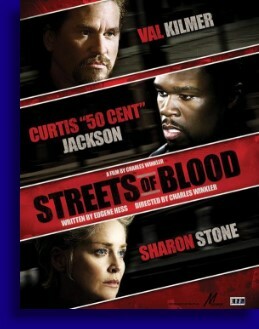 Oddly enough this here movie ‘Streets of Blood’ is just the opposite for it has some fantastic individual parts, mainly in the form of some terrific actors and an interesting story line which all combines to make up one of the biggest disappointing messes of a movie I’ve seen in some time. Dateline: post Katrina New Orleans. Say hello to gruff and grizzled NOPD detective Andy Devereaux (Val Kilmer) who has just found his former partner dead, bloated and floating in the water with the added insurance of a bullet in the head. Why was his partner killed? Hmmm… that’s damn good question that this movie will not answer for you. Sometime during this evening Detective Andy makes the acquaintance of beat cop Stan Green (Curtis Jackson) who does some stuff to prove himself worthy, and thus finds himself elevated from the street to detective and is now to assigned as Andy’s partner which begins our duos adventure in the Big Easy. Somehow in the midst of all of this confusion there is an actual case that our cops, including the corrupt ones, are investigating. I know it has something to do with drugs but that’s about all I know. Oh yeah, Sharon Stone sporadically pops up in this movie as some psychoanalyst, with one of the worlds worst Cajun accents, who is grilling our cops with inane questions which only add up to more confusing nonsense. The thing is that one of our quartet of cops is a rat. I guess. Detective Andy hates rats because he fights for what’s right. And what is right obviously includes shooting people indiscriminately, Miranda simply representing a first name of certain old ladies, and a warrant, search or otherwise, is just the name of an 80’s hair band. Allow me to warn you that nothing will become clearer as this movie drones on. I kid you not when I tell you that almost nothing in this movie ‘Streets of Blood’ makes almost no real world sense. The characters do things that don’t make any sense, the narrative takes the characters to places that make no sense, the resolution to this mess makes no sense, nothing makes any freaking sense. On the surface however ‘Streets of Blood’ certainly showed some promise. Sure Val Kilmer might not be the golden haired leading man he once was but he is still a very good, if not somewhat portly actor who still delivers good performances but there was nothing he could do here to save this incredibly fractured narrative. Toss in some very solid character actors such as Michael Biehn, Jose Pablo Cantillo – who does controlled crazy about as well as anyone - and veteran actor Barry Baraka Henley and you have a pretty tight cast of characters over here. Yeah, Curtis ’50 Cent’ Jackson isn’t the second coming of Sidney Poitier but aside from the incredibly asinine lines of dialog that he was forced to speak here and there, even he wasn’t all that bad. Sharon Stone served almost no purpose in this movie however, and while we are happy to see a young lady get a paycheck for an honest days work, they could’ve left all her scenes on the cutting room floor and the movie wouldn’t have been any worse for the wear. And she would’ve still gotten that paycheck. But the biggest problem with ‘Streets of Blood’ is that director Charles Wrinkler just wasn’t able wrangle the wildly out of control narrative into anything that slightly resembled coherence or even provided the slightest bit entertainment. By the time this movie was over, this movie watcher had way more questions than answers, I had no idea why this character did that or that character did this and then I think there was a twist of sorts which only served to make a ridiculous flick even more ridiculous. On a more positive note this movie also featured one Pilar Sanders, wife of future Hall of Fame Cornerback Deion Sanders, in the role of 50-Cent’s wife and mother of his three fictional children. Not that the young woman did anything of note in this movie but she is hot as hell and dressed about as inappropriately as any cops wife and fictional mother of three ever has in the history of movies. I gotta imagine that raising three bratty kids while wearing tight jeans, a halter that’s two sizes two small and stiletto heels has gotta get uncomfortable after a while but girlfriend made that work. That aside ‘Streets of Blood’, while not the worst movie around, did manage to be one of the more disappointing movies I’ve seen in quite some while. Move along, not a helluva lot to see here.